Portable patio heaters from SBM (France) are LPG fired high intensity infrared radiant panel heaters specially designed for cafes. Ceramic infrared heaters are perfect not only for cafe and restaurant outdoor areas, but also for rental and catering businesses and for use on private verandahs and patios. The portable infrared heaters are designed for an operational life of more than 20 years and provide energy efficient alternative to standard patio heaters and pyramid heaters. The HeatGlo 12 and 16 feature a stainless steel trolley / 9kg cylinder housing unit and are supplied in kit form with trolley and hose assembly with adjustable gas pressure regulator. The two models incorporate the standard 4 tiles and 5 tiles SBM ceramic tile assemblies. All models are approved for outdoor applications when shielded from rain and wind speed in excess of 15 kph, including residential applications such as verandahs and patios. Compare fuel consumption of ceramic heaters with patio and pyramid style heaters and check their total cost of ownership. 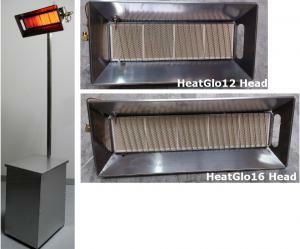 The video details assembly of the HeatGlo trolley unit. In addition there is a ‘servicing‘ video in the ‘Livestock High Intensity’ section of the website. Check out our YouTube video showing how to connect a gas cylinder and operate the heater. You can find all the radiant tube heater information at our new micro-site focusing only radiant heaters at radiantheater.com.au.